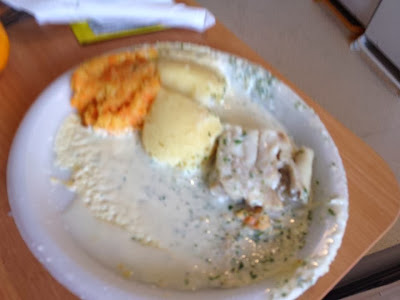 I have blogged once before about the shocking food received in an NHS hospital by a friend of mine who was a patient there. She is entitled to feel angry. I am angry too. Very. In fact, lots of us are furious on her behalf. This term in my lectures, we have been frequently told about the fact that many people who are admitted to hospital become quickly malnourished because they aren't fed adequately. Which makes recovery a lot harder. Charlotte has spoken VERY highly of the nurses looking after her and I am sure she is right. We are so lucky to have a National Health Service. However, this really is unacceptable and is probably happening in many other places all round the UK. Charlotte only has the use of one arm. They won't even help her spread butter on her toast. Come on Basildon Hospital, you really need to buck up your ideas. Pronto.